Decadent pie made from chocolate-loaded graham cracker crust filled with smooth coffee flavored filling and topped with whipped cream and more chocolate chips. 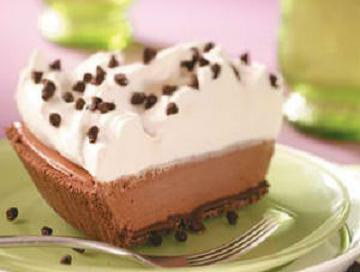 Here is an easy dessert recipe for Coffee Cream Pie. To make crust, melt butter and semisweet chocolate chips in a heavy saucepan over low heat. Stir in graham cracker crumbs then spoon into the bottom and sides of a buttered 9-inch pie plate. Bake for 8 minutes. Cool. For filling, combine sugar and cornstarch in a large, heavy saucepan; set aside. In a bowl, combine instant coffee powder and boiling water; stir until dissolved. Gradually stir the coffee mixture, milk, and egg yolks into the sugar mixture. Cook over medium heat, stirring constantly, until the mixture thickens and comes to a boil. Boil for 1 minute, stirring constantly. Remove from the heat, stirring smooth. Place plastic wrap directly on the surface of the mixture to prevent the formation of "skin". Chill for 1 hour. To make the topping, beat cream to soft peaks then gradually add powdered sugar and beat until stiff. Fold 1 1/4 cups of the whipped cream into the chilled coffee mixture, reserving the remainder for garnish. Spoon the coffee mixture into the graham cracker shell. Garnish with the reserved whipped cream. Sprinkle with mini chocolate chips.